Please feel free to post your bad transit poetry. Or bad poetry inspired by transit. Or something like that. A nice reminder of Mama Earth’s diversity. Which you can help preserve, generally speaking, by forgoing driving alone every so often and taking transit. Without getting a mouthful of weeds, the big provision here is that it would change the threshold for local sales tax ballot measures from two-thirds to 55 percent. In days of yore, only a majority vote was needed. Lowering the threshold has been talked about in recent years but nothing has happened. Measure R in 2008 managed to get nearly 68 percent of the vote while Measure J in 2012 failed with 66.1 percent approval. In any case, Metro’s sales tax ballot measure that goes before voters this fall will need to reach two-thirds. In terms of public policy, the advantage of a high threshold is that a tax hike must please an awful lot of voters in order to be approved. The disadvantage: well, some folks have argued that potential benefits have to be spread too far and wide, thus making it harder to accomplish anything. Have at it, Pittsburgh! Photo by Dan Chmill, via Flickr creative commons. Uber’s Pittsburgh fleet, which will be supervised by humans in the driver’s seat for the time being, consists of specially modified Volvo XC90 sport-utility vehicles outfitted with dozens of sensors that use cameras, lasers, radar, and GPS receivers. Volvo Cars has so far delivered a handful of vehicles out of a total of 100 due by the end of the year. The two companies signed a pact earlier this year to spend $300 million to develop a fully autonomous car that will be ready for the road by 2021…. Sounds good to me. Experiment on Steelers fans. As I wrote yesterday, I reserve the right to be skeptical about all this. Airplanes are getting closer to one another on runways and taxiways than FAA rules allow. In aviationspeak, this is known as a runway incursion. In plain English, it’s known as “Oh, *&$#!” There have been eight incursions since Oct. 1, 2006, with four on the north runways. Two have occurred in the last three weeks. In the time since, there has been a lot of arguing about whether moving the runway north would actually make LAX any safer. In the meantime, the airport has gotten busier. Thus the new deal. In exchange for halting that project, LAX gets to add some passenger gates and the cap is lifted on the number of passengers the facility can serve annually. That’s probably important to the city of L.A., which owns the airport and is also pursuing a certain big sportsing event in 2024. 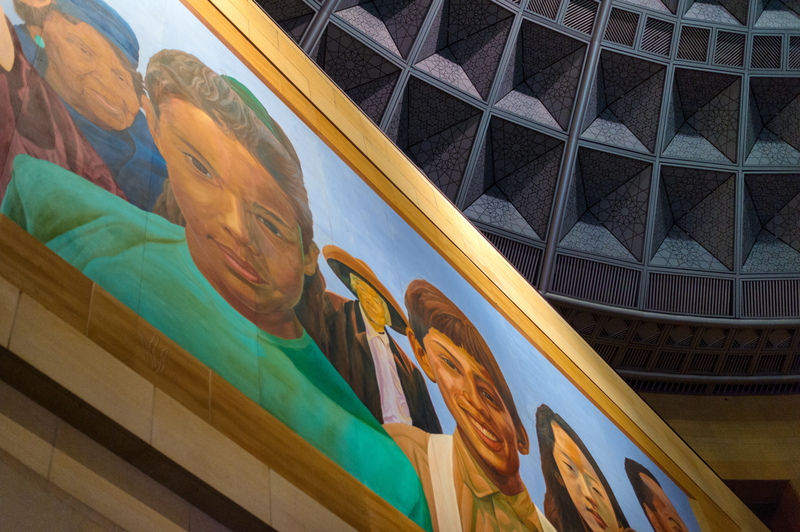 The awesome mural in Union Station’s East Portal. Photo by Steve Hymon/Metro. A nice look at the Metro Art program that strives to make our stations and facilities a more pleasant place to whilst away a few minutes. Some heated — get it!? — exchanges between the New York Subway and some overly warmed passengers. Editor’s note: between now and last January, the NFL ruled: that the Steelers lone TD in their playoff win over the Bengals probably wasn’t a TD; a Steelers coach should have been penalized for being on the field before the winning field goal was kicked, and; a hit on a Bengals running back that caused a fumble and concussion was made illegal for this season. I’m just writing this down as part of my ongoing therapy as a Bengals fan. Isn’t that LAX deal like stopping the annoying local barking dog from moving 1 house closer, by allowing 5 more annoying barking dogs to move into the neighborhood? NIMBY homeowners proving again that they don’t really grasp whats happening in the world. Steve, I agree with your sceptism on driverless cars. I believe the insurance and tort issues will make or break (more likely break) this whole movement. I don’t see the auto makers being willing to take on the added liability that will come with driverless vehicles (Pennsylvania is a “No Fault” state, which means Uber will have to carry commercial liability insurance on their vehicles.) In addition, when you see things like the massive recall of key safety components (airbags), all it will take is one similar recall of a key component to the driverless system and the insurance industry will walk away. I believe this is another area where technology is out distancing the necessary public policy and legal aspects.